Restoration Agriculture: Real World Permaculture for Farmers is a long overdue call to revolutionize farming as we know it. Mark Shephard shares a vision of renewed soils, diverse ecosystems and healthy watersheds – filled with an abundance of nutrient rich food crops. He begins with some background information on agriculture as we know it, and then progresses to the new reality of permaculture farming – restoration agriculture. Since WWII, our food crops have been increasingly bathed in a cocktail of herbicides, pesticides and chemical fertilizers. The industrial complex that won the war turned its' collective might to fighting the insects and diseases that damaged crops. Farmers were told to “get big or get out”. The “Green Revolution” promised to “feed the world” with crops that produced higher yields per acre and genetically modified crops promised pest free fields free of weeds. Industrial agriculture companies such as Monsanto, Cargill and Del Monte vowed to bend nature to the will of man. The thing is, Momma Nature had other ideas. The megalithic proportioned machines that allow the planting and harvesting of huge monoculture fields compact the soil, forming a dense hardpan under the topsoil that prevents crops from accessing deeper nutrients. The huge fields that stretch for miles and miles through the heartland are ripe for erosion. Indeed, there is very little topsoil left in most of our prime agricultural regions. What soil is left is often dead and lifeless, killed by the herbicides and pesticides. Crops survive only through the application of large amounts of chemical fertilizers, often watered by rapidly depleting aquifers. The Green Revolution and genetically modified crops were found to only give higher yield with the application of the industrial chemicals, and the seeds from these crops could not be saved from year to year like the heirloom and open-pollinated crops farmers had grown before. Around the world, farmers who had formerly been self-sufficient were now deeply in debt. Suicide rates among farmers have skyrocketed. Read “Monsanto's GMO Seeds Contributing to Farmer Suicides Every 30 Minutes“. The time has come to, as Mark put it, “stop trying to grow things that don't want to grow and killing things that do want to grow”. Permaculture focuses on working with nature instead of against it. There are many variations on this theme, but all work to restore ground cover, protect (and rebuild) topsoil, conserve and clean water, and create a healthy, balanced ecosystem. The majority of crops in the system are perennial, not annual, so they are planted once to produce for many years. The permaculture food production plot is not static. The amount of food and variety of food produced evolves as the plants grow and change. Animals also have a place in the restoration agriculture system, to help manage diseases and control plant growth, as well as to produce a valuable crop in their own right. Honey and mushrooms represent yet another facet of this amazingly productive polyculture. Instead of growing one crop, such as corn or wheat, from a plot of soil, the farmer can now grow many. 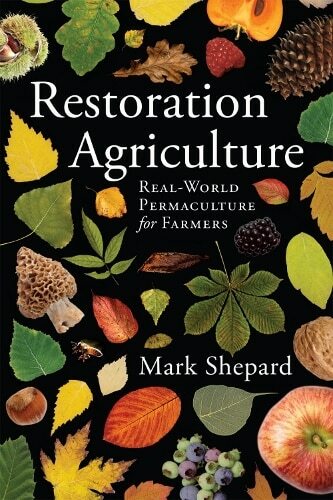 When I first started reading Restoration Agriculture, my initial reaction was, “That is so cool!”, quickly followed by, “Can you really make it work?”. The short answer is, “Yes.” mark has written this book largely based on his own successful experience at New Forest Farm, a 106-acrea commercial scale perennial agriculture ecosystem that was converted from a row-crop grain farm. If you'd like to hear more in Mark's own words, you can watch his presentation to a group of organic farmers. It touches on many of the topics included in the book. I hope you're as intrigued as I am about diversifying our food sources, healing the soil and providing everyone with healthy food. I did not receive any money for reviewing this book, only a copy of the book itself. Driving through Nebraska on a road trip a couple of years ago, my hubby and i saw the miles of corn fields. It almost broke my heart, it was so unnatural and even eerie. No towns, no houses. Just corn, as far as the eye could see. There’s got to be a better way – thank you for promoting this book. It sounds fascinating. Very nice! thanks for the opportunity! I am interested in gardening with chickens – what healthy plants can we put in the chicken run to make the chickens happy and pretty it up. At some points, our run looks like mudville. Gross! My husband really wants to produce our own strawberries. As a family of 8 we go through over 120 half-pint jars of strawberry jam a year, not to mention the fresh ones we eat. Commercial growers plant new plants every year. Is this necessary for the home grower? And how much land would it take to produce enough strawberries for us? I have heavy, clay soil and every fall I add leaves and other organic materials to my garden plot. I feel like I have been doing this for years now and my soil is still very heavy. How much organics do I need to add to my soil to get it more loamy? Is there anything specific I could add to lighted it up? Thanks for your help with this. Kathleen – i’m not sure from your comment how much land you’re managing, but you may want to try a completely different approach with a section of it. The “Back to Eden” method has worked in similar situations with challenging soil from too much clay, or too much stone that was just impossible to remove. I have gotten a lot of useful info from your blog. I have a small farm with chickens and goats and a large garden, all raised organically. This book would be such a great tool to help me enrich my farm. Thank you for offering this chance to win one. I am interested in planting a perennial fruit garden using permaculture methods this coming year. What are some good ways to effectively keep weeds at bay? Jenn, one way I like to keep weeds at bay is to plant some other kind of ‘weed’ there that will overpower them, like dandelion, mint, or some other beneficial herb that is a strong grower. It depends on what kind of weeds you’re trying to control, but there are great resources on all the ‘edible weeds’ for your region that are extremely hearty. Or cover crop (green manure) plants like clover. These naturally fix nitrogen directly into the soil to fertilize your other plants. It makes for a little bit messier of a garden, but it can increase the biodiversity, production, and output of your available planting area. Sounds like an interesting read. We just moved and are in the process of building another garden. I don’t have a suggestion this is exactly what I’ve been interested in learning about. Thank you for the opportunity to win this great prize. Good luck everyone. The more I learn, and the more I garden in my own yard the more important this becomes to me. Yes, people need to be fed but not at the cost of poisoning them over the long haul! This book sounds like it’s exactly the information I have been looking for! My husband and I are working toward finding a house for sale with enough land for a good size family farm. My biggest question is really just how to get started once we find a place. What are the most important factors to consider when starting out? Can this form of agriculture be adapted to a backyard garden? I love my garden and love reading on anything permaculture. Want to learn more about the ins and outs of beekeeping in the future. Maybe also growing fruit trees. I would love to know if this kind of thing can work in a suburban garden–and if so, how? Hi Adrienne – check out this video clip from Geoff Lawton. He’s the founder of the Permaculture Research Institute in Australia. Small scale suburban permaculture in a tiny backyard — 80 medicinal plants, 30 fruit trees, 70 kilos of vegetables, vertical wall growing, 161 kilos of fruit, 22 varieties of berries on 640 SQUARE FEET. Some of the best ways to restore our agriculture is to grow our own food as much as possible, buy as much as we can from local farmers whose practices we know, and not to buy processed food (which only supports Big Ag). Our dollars are the best way to change things! I am very interested in growing heirloom vegetables and fruits. Sustainable agriculture! I am really interested in permaculture and sustainability. Thank you for sharing this. This nation is going to have to embrace sustainability and self-sufficiency. Those five states of endless GMO corn I drove through this summer were a clear reminder to me that what I do on my own little plot is much more natural and normal than industrial ag. I live in a mobile home with a little postage stamp garden in the back (5’x25′). My neighbors on both sides have put up fences with treated wood. How far away from the fences can I safely plant my garden and is there anything I can do to minimize contamination from rainwater? My friend suggested planting flax along the fence lines. Hi Laura. We used to have a very small garden with the same issue. A couple of suggestions, you can make your own raised beds and fill them so the plants are less likely to get exposed to toxic material. Galvanized feeding troughs come in various sizes and can be used for this. You may here some concerns about the zinc but if you do a little reading on natural and organic sites they say that zinc is only released in very acidic environments. So they don’t recommend brewing, drinking orange juice, or things like that from a zinc container. But galvanized tanks for swimming, gardening, feeding animals are claimed to be safe. You can also use a “bio swale” along the fence, which is a kind of natural catchment system. Imagine a small indentation running along the fence line that will catch water and allow it to settle. You’ll want to fill it with plants that capture (sequester) the pollution in their root and stem systems. The idea of planting flax along the fence line is basically doing that. Different climates will have different plants recommended for a bio-swale system that you can usually find on google – my state has a lot of resources about their experimental systems. And different plants are often used for different toxins, for instance I have frequently read about using sunflowers for to take lead out of the soil, but I haven’t done this myself. The only downside for bio swale is your small garden size, so high raised beds may give you more planting space and more comfort about the toxin exposure. This is a great concept. Even better to see permaculture put into practice on a commercial scale. Woo too! This is very interesting and I’d love to read more! This book was mentioned in ‘The Resilient Farm and homestead’ which ii read recently. It was a fantastic book, and I have been desiring to read all the books referenced in it, I am looking forward to checking out this tittle, thanks! Ooo – that sounds like a good book! Always look forward to learning something new! I would like to know more about how to care for my strawberry patch from year to year and how to grow other not so common fruits, like kiwis, in zone 5. Love the information you are giving, We will be putting it gradually into effect this coming growing season. Regarding small scale permaculture – if you’re not familiar with the term ‘permaculture’ it covers a lot of ground (no pun intended) but on the agricultural aspect, permaculture essentially teaches how to mimic natural ecosystems for food production. For instance, a permaculture “food forest” is a forest garden that replicates all the components of an actual forest, so that the plants become self-sustaining, self-fertilizing, with only natural inputs, and that the output of the garden is higher than the input, without having to bring in amendments. There are many great resources on “smallifying” permaculture concepts for your urban garden. This Geoff Lawton video clip shows a permaculture backyard with 80 medicinal plants, 30 fruit trees, 70 kilos of vegetables, vertical wall growing, 161 kilos of fruit, 22 varieties of berries on 640 SQUARE FEET. Here are two articles I wrote for Permaculture Magazine.uk for permaculture experiments in small raised beds. A ‘worm tower’ which composts directly into the bed, and raised bed hugelkultur. Hugelkultur is the world’s simplest permaculture system. Basically you cover a pile of wood with dirt. The rotting wood has a tremendous capacity to store water, supports beneficial soil organisms, fungal webs, and as it decays, is self-tilling (in the sense that it reduces soil compaction) and generates nutrients that feed the plants. This system takes several years to establish, but can have positive benefits for 20-25 years. What could be simpler than covering a pile of wood with dirt? Not much. I’d love to more about building a cold frame….picking a good location (I’ve got a spot that faces south and is protected by the garage and the house that I’m wondering about) and how to build it with limited skills, etc.) This and building a chicken coop are two of my ‘must do’ projects for the next year! I would like to see articles about different alternative crops, everything from how to grow dandelions for root harvest, to elderberry forests. Also, I have free range chickens, but still have to supplement feed for them if I am to get them to roost in the chicken house and lay eggs in there. In Indiana, where I live, there are miles of corn fields, corn, corn everywhere but not a grain to eat. They are GMO. I used to glean the corn fields next door, my neighbor didn’t mind, but now I feel I am feeding my chickens slow poison. What can I feed my chickens that isn’t GMO without spending an arm and two legs? Looks like a very interesting book. What can we do to get more individuals to learn to be more self-sustainable with gardening/farming? This is an awesome giveaway! Would LOVE to add this to our library. 😀 Thank you for the opportunity! Sounds like a MUST for the library. Great book! We compost and we dump leaves and wood chips in the garden for over the winter to decompose. I was just telling my kids that next year I want an enormous garden and do some canning too! So between now and then I want to learn all I can because I have ot had a garden in about 12 years or canned in that long as well. I want to try and get a years worth of food put away before next winter! I can’t hardily wait. this is so timely and interesting, we are trying to cope with many of the problems mentioned on our 5 acre farm. I am interested in learning about Permaculture — i.e., returning waste back into the system to recycle. I’ve done some research on Monsanto and the practice of using genetically engineered seed for crops. It truly is a win for Monsanto et al, and a definite lose for everyone else. The use of “Round-Up Ready” seed just means that in a year we’ll have an evolution of natural pests that become impervious to the built-in pesticide in ge crops… leading to yet more lethal and dangerous chemical development to poison the earth. We can’t continue to sustain this trend. As more and more people present with allergies and gut issues from foods produced by genetic engineering, the answer is not to invest in processed foods but to return to the old ways, nature’s ways. This won’t happen unless and until we all take a united stand against genetic engineering in seeds, and unless and until we all boycott all foods not certified to be non-ge. I love that there is a growing awareness that farming needs to change for the better. I have a big organic garden and I am hoping to get all my neighbors involved in having a neighborhood homesteading movement by each of us doing something like rabbits, chickens, gardening, etc. I would like to know how to grow soursop plants. Could you please give me some ideas on how to start them from seed (indoors) and what sized pots, type of soil, how deep the soil, and the care of the plant. Thanks! Looks like a great book! I would love to hear more discussion on the changing weather patterns and how we can adapt our growing gardenns/farms to them. Hey! I’d love to have that book! I’ve just gotten into gardening the last 2 years, I am working on raising some plants indoors this winter. Would love to win. I will be retiring this Jan. I can’t wait to start working on my own permagarden! My winter project is to set up a small aquaponics system in my kitchen for growing cook herbs and such. We want to incorporate “pigerators” into our system. Also want to expand our orchard. Looking for more information. I’m excited to get my hands on this boom! Very interested in learning all I can about permaculture and implementing the principles on our property. Working to aquire 18 acres and move toward off grid and self-sufficient. Would love anything you choose to write about that will move is in this direction!! For the life of me, I can never successfully grow radishes. I have tried growing them in raised beds, straight in the garden, part sun/shade, full sun, composted soil, and so many other situations. I thought they were supposed to be one of the easiest to grow. Any suggestions? They like cooler temps and plenty of moisture, not too rich soil or they get leaves but small roots. vital to my lifestyle, trying to learn and live a regenerative lifestyle.